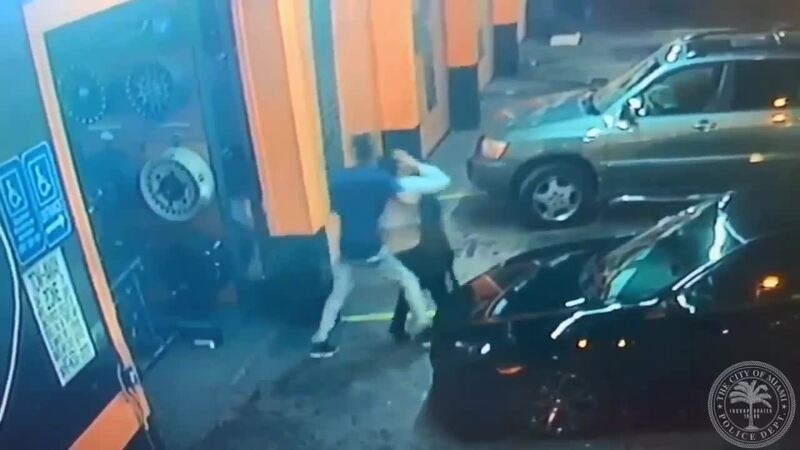 Miami Police Department released the footage in the hope to identify the woman after it was reported that she screamed "call 911, he's going to kill me" before being forced into the vehicle by what police believe was an armed assailant. Witnesses said the woman tried to hide in a restroom. Shortly after she walks in, the woman can be seen being dragged out by a male. - Police in south Florida say a woman has been found safe after she was allegedly abducted outside of a Miami business. "He takes her from the restroom and hit her like, I don't know, 20 or 50 times", said the witness. "He's going to kill me", she screamed before being forced into the man's vehicle and driven off, witnesses told WPLG-Ch. 10. "He hit her like 20 more times with the door". "We need apprehend this individual". Partial numbers from the tag are CFJ7 or CJF7.